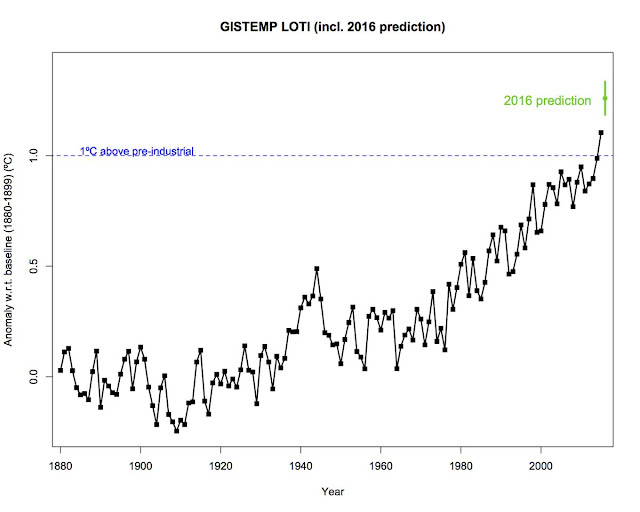 NOAA's Climate Monotoring Chief Deke Arndt tweeted in May this year: "I look at this stuff every day and it still astonishes me" and showed this graph. Note, the locally typical units. Honey, I broke the graph. Again. How the temperature has risen the last years is amazing. The prediction made this week for 2016 by Gavin Schmidt of NASA GISS does not look good. With a bit of British understatement he is 99% confident 2016 will be a record year. That temperature jump is one reason people have woken from their slumber. Another reason is that people have started visualising the global temperature increase in interesting new ways. Let me try to explain why they work. It all started with the animate spiral of the global temperature of Ed Hawkins that went viral. The spiral went viral because it was a new way to present the data. It was also very good timing because the spiral especially shows well how extraordinary the current temperature jump is. The modern currency is attention. So just after the Olympics I tried to top Ed Hawkins with this visualisation. By my standards it went viral. 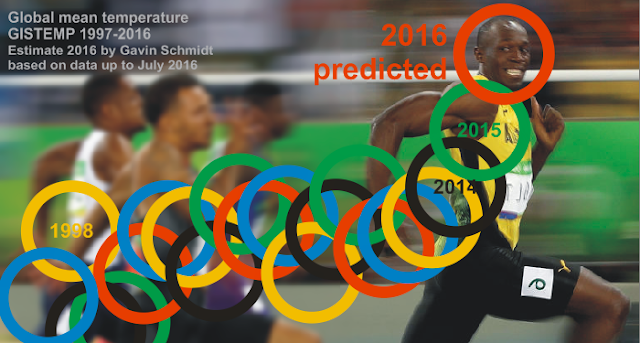 It works because visual connects global warming to the famous Olympic photo of Usain Bold running so fast that he can afford to look sideways and smile at the camera. I guess the virus did not spread beyond the few thousand people discussing climate change every day because without the axes you need to know the temperature signal to get it. Adding axes that would destroy the beauty. In the last episode of Forecast Scott St George tells about his project to convert the climate signal into music. The different instruments are different climate regions. At the time this creative idea generated a lot of media attention. Works well on radio and TV than a static graph. More regional detail can be seen in a so-called Hovmöller plot. The plot by Kevin Anchukaitis shows time on the horizontal axis and the colours indicate the average temperature over latitudinal bands. In the lower half of the figure you see the Southern Hemisphere, which warms less than the Northern Hemisphere at the top. The additional energy that is available due to the stronger greenhouse effect can go into warming the air or evaporating water. The Northern Hemisphere has much more land, is drier. Thus evaporation increases less and warming more. The front of the new State of the Climate also shows the observed temperature signal in red and brown. 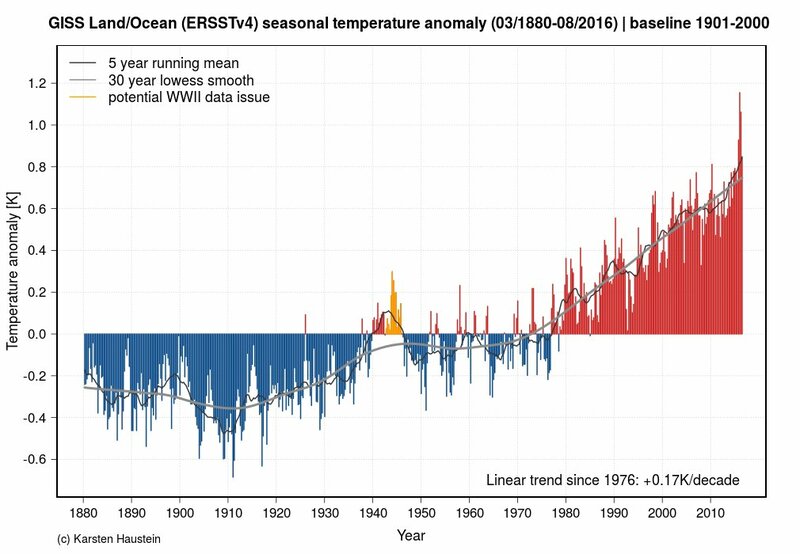 Probably the most eye opening graph to understand the difference between short-term fluctuations and long-term trends of the temperature signal is this one. An important source of fluctuations is the El Nino in the Pacific ocean. By plotting years with El Nino, its counterpart La Nina and neutral conditions separately, you immediately see that they all have about the same long-term trend and that El Nino is mainly important for the short term fluctuations. No need for statistics skillz. I realise that it is just a small tweak, but I like this graph by Karsten Haustein because it emphasises that the data in WWII is not very reliable. The next step would be to also give the decades around 1900 the colour of the orange menace. The data in this period also has some issues and it may well be warming. This animation by John Kennedy shows the uncertainty in how much warming we had by displaying a large number of possible realisations. This is the uncertainty as estimated in the temperature dataset of the UK Hadley Centre (HadCRUT) due to instrumental changes; it does not include the uncertainty from not having measurements in some areas (such as the Arctic). 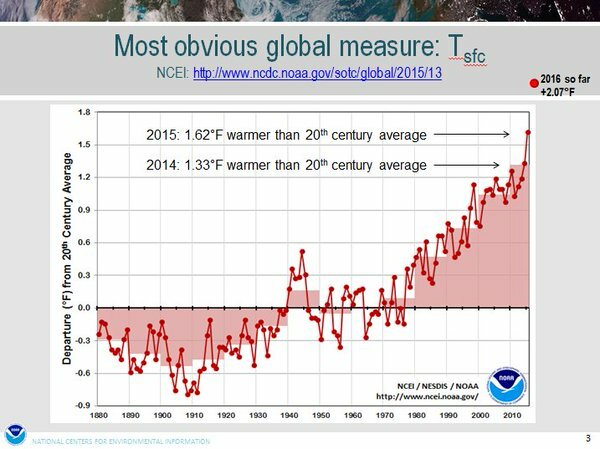 If you plot monthly temperatures rather than yearly averages, the warming graph becomes more noisy. Mitigation sceptics like to plot data that way; the trends naturally stay the same size, but the noise makes them seem smaller. This beautiful solution by John Kennedy plots every month separately and thus shows that all months are warming without distracting noise. You can also show the seasonal cycle like in this NASA example, or animate it. The sun is the source of nearly all energy on Earth and naturally important for the climate, but also for climate change? The sun was quite stable the last century and the last decades the sun may even have become less bright. By plotting the sun and temperature together Stefan Rahmstorf illustrates that the variations of the sun are too small to influence the climate much. Back in 2013 Jos Hagelaars combined the temperature reconstructions (from tree rings and other indirect information sources), the instrumentally measured temperatures and the temperature projection up to 2100 into one graph, also called The Wheelchair. 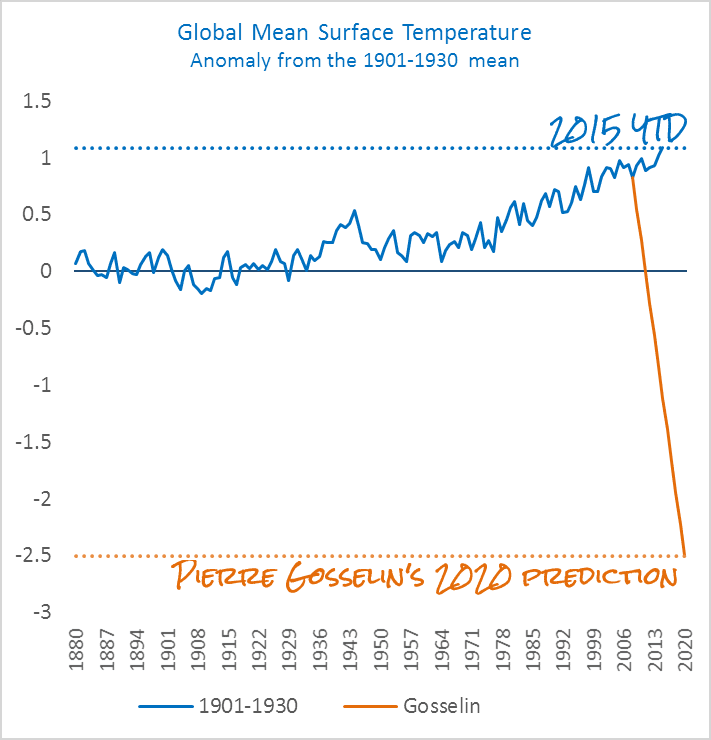 It makes clear how large and fast the expected warming will be in a historical perspective. 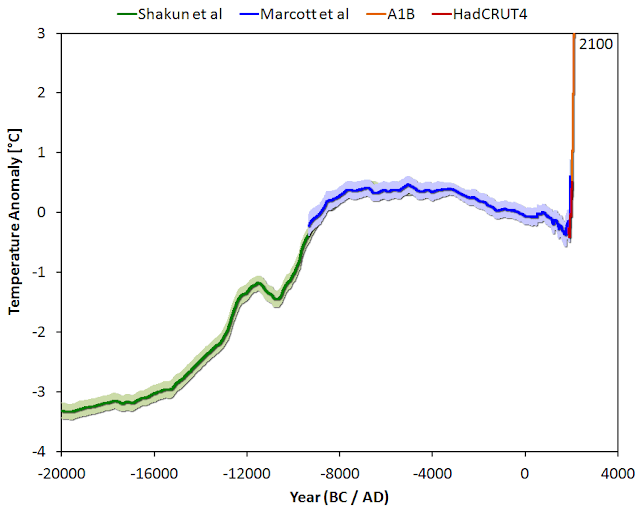 The projected warming jumps up so fast in the graph of Hagelaars that you cannot see well how fast it is. Randall Munroe of the comic XKCD solved this by rotating the graph, so that it can be plotted a lot longer. 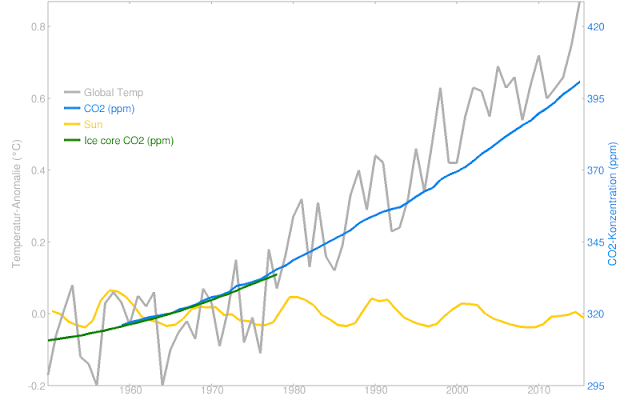 To see how we are warming the planet, the graph had to become very long. Happy scrolling. See you below. Listen, your car's temperature has changed before." 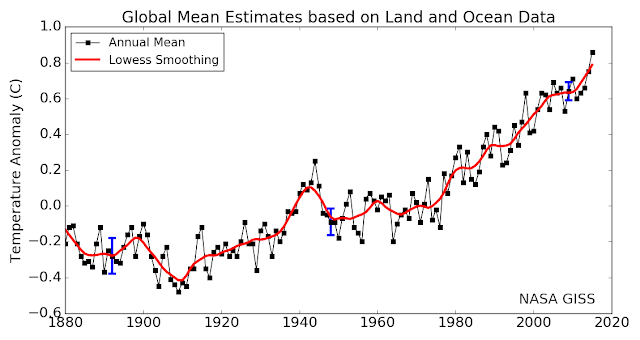 Some complain that the temperature reconstructions are smoother than the instrumental data. This although it is even explained in the comic. How much more geeky can you get? They want to suggest that thus a peak like we see now could be hidden in the reconstructions. That is theoretical possible, but there is no evidence for that. More importantly: the current warming is not a peak, it is a jump, it will still get a lot warmer and it will stay warm for a very long long time. 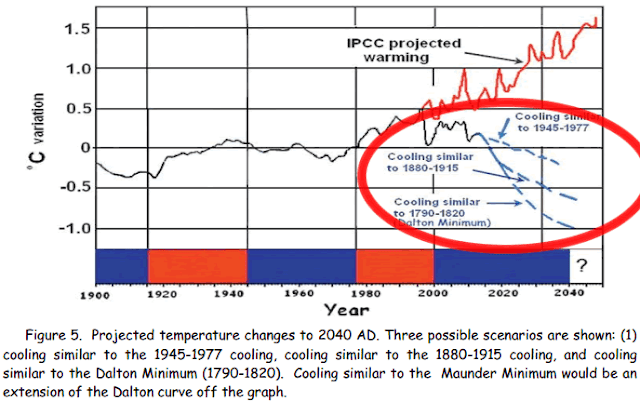 If anything we are doing to the climate now had happened in the past it would jump out in the reconstruction. Chris Colose solves the problem a little more technically and puts the current and future warming in the context of the period during which our civilization developed in this animation. HotWhopper gathered and visualised some predictions from mitigation sceptics. Pictures that stand in sharp contrast to scientific predictions and in a sane rational world would discredit their political movement forever. David Archibalds' prediction from 2006. 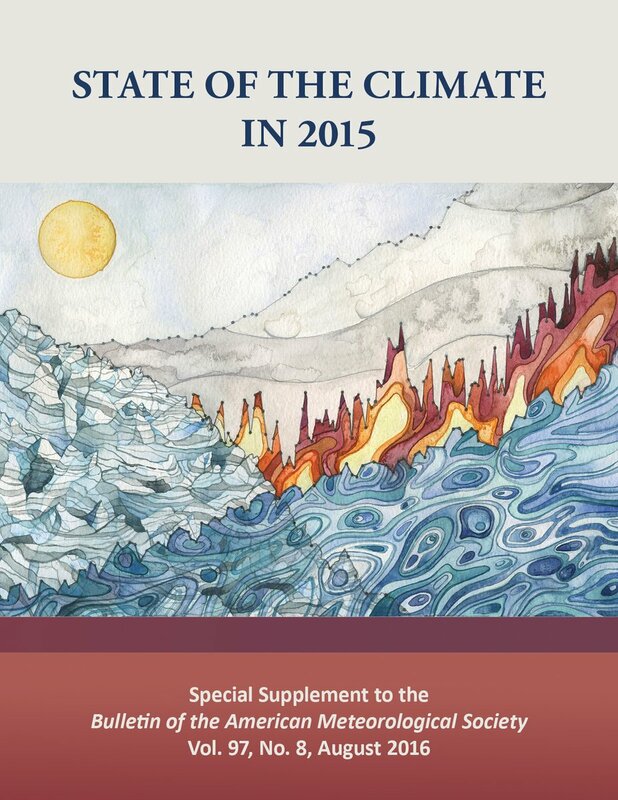 Based on solar maxima of approximately 50 for solar cycles 24 and 25, a global temperature decline of 1.5°C is predicted to 2020, equating to the experience of the Dalton Minimum. -2.5°C by 2020!...My prediction is we’ve started a nasty cold period that will make the 1960s look balmy. We’re about to get caught with our pants down. And a few molecules of CO2 is not going to change it. 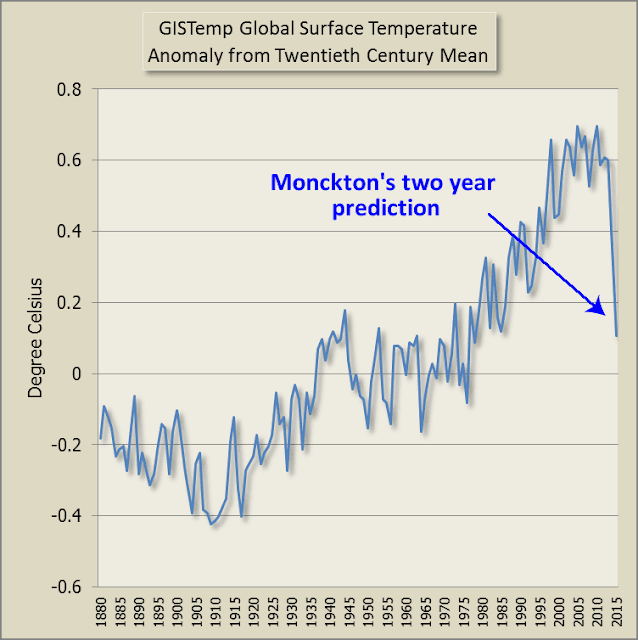 Christopher Monckton prediction in 2013. A math geek with a track-record of getting stuff right tells me we are in for 0.5 Cº of global cooling. It could happen in two years, but is very likely by 2020. His prediction is based on the behavior of the most obvious culprit in temperature change here on Earth – the Sun. Maybe the Lord's math geek got a minus sign wrong. Will be hard to get so much cooling in 2020, especially as promissed due to the sun. A normal scientific graph can be very effective. I loved it how the audience was cheering and laughing after having to endure the nonsense of Australian Senator [[Malcolm Roberts]], when the physicist Brian Cox replied with: "I brought the graph." A good sign that the public is fed up with the misinformation campaign of the mitigation sceptical movement. The graph Cox showed was similar to this one of NASA-GISS. You know what they say about laughing at geniuses. I hope. A similar idea as the orchestra playing global warming is this tune based on the flow of the river Warta in Poland. The red noise of nature sounds wonderful. * Temperature curve of XKCD used under a Creative Commons Attribution-NonCommercial 2.5 License. The Grand Old Party has created a monster and now it has turned on them. It would be tempting to simply call the monster Donald Trump, but the unnamed monster has many aspects: Trump, conservative media, anti-science, rejection of adult debate, corporate corruption, climate change denial, racism, fear. One reason to call the monster Trump would that Trump has taken the syndrome to such extremes. A second is that Trump made many prominent conservatives realize that the monster threatens their party. This threat becomes visible in the list of positions Trump is able to sell that are far from Republican and Trump has started attacking conservative politicians directly. To solve the problem the GOP will have to return to rational debate, rather than ending every second sentence with "believe me". Conservative readers, did you notice that "believe me" did not work when you thought you should believe me? It is just as stupid coming from your side. Give people reasons to accept what you are saying. The GOP had rational debate in the past, like non-US conservative parties do. What makes rational debate hard is that US politicians now take position based on what the donors want. The incoherent mess a politician then has to defend cannot be defended rationally. Rational debate thus needs to be replaced with misinformation. To make the misinformation palatable politicians need to stoke fear to suppress critical thought and fuel tribalism. "What it became, essentially, was they were preaching this is the only place you can get news. This is the only place you can trust. All other media outlets are lying to you. So you need to come to us." That now makes it hard for conservatives to contain Trump and point out his lies. The term "lie" may not even be appropriate for Trump. To be a lie you have to be aware that what you are saying is wrong and for a conman like Trump right and wrong are irrelevant, what counts is whether a message sounds convincing. When what Trump finds convincing does not fit to the GOP platform, its politicians cannot point to fact-checkers or The New York Times because conservatives have been convinced these sources are lying. Reinforced by Trump tweeting about "The failing New York Times" or the "the disgusting and corrupt media". The conservative establishment that needs to be gotten rid of is the conservative media establishment. Sean Hannity needs to go. Bill O'Reilly needs to go. Sadly, Rush Limbaugh needs to go. Here's what I'll be very disappointed in: If Trump does lose, as I am very confident that he will, and let's say it's not super close, if he loses by a significant margin and Sean Hannity and people like him have not experienced some significant career pain, if not destruction, because of their role, then it's over. It is over. Because if there is no price to pay for conservative-media elements having sold out to Donald Trump, then guess what? It's going to happen again and again and again. ... If that doesn't happen, then I think we're done. It's over." I am not sure how much purging specific persons would help. The system needs to change. The media is nowadays financed more and more per view, per click. This pushes the system to scandal and rubbish, to emotion, fear and exaggeration. Europe benefits enormously from a public media system, that may be more boring, but normally gets the facts right and this forces other media sources to also deliver higher quality. The population also has an important role in keeping the media and politicians honest by doing their due diligence, giving feedback and selecting credible sources. I think twice before I click on a link to a Murdoch publication because every click converts misinformation and vitriol into cash. Due diligence is hard in a culture where people have little time for citizenship because of the stress society produces and a focus on working long hours over working effectively and creatively. "I think the conservative media is the worst thing that has ever happened to the Republican Party on a national level,"
There is a movement to newspapers, magazines and video news and entertainment that is supported by members. This will lead to more partisanship and a splintering of the media landscape. Still, members will likely be people interested in quality. Thus hopefully the partisanship will be limited to having a clear point of view and finding certain stories interesting, but the facts will be right. If the quality is right that would be progress. If the quality is right, the splintering of the media does not have to lead to a splintering of society because there would be a common basis that makes communication possible. Objectivity is what makes science so valuable in society. It is the public guarantee of reliable disinterested knowledge. Science plays a unique role in settling factual disputes. This is not because it is particularly rational or because it necessarily embodies the truth: it is because it has a well-deserved reputation for impartiality on material issues. The complex fabric of democratic society is held together by trust in this objectivity, exercised openly by scientific experts. 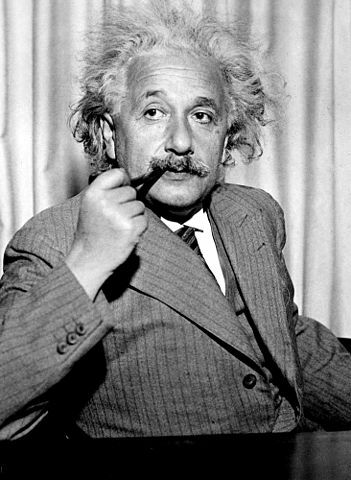 Without science as an independent arbiter, many social conflicts could be resolved only by reference to political authority or by a direct appeal to force. I would expect that it is no coincidence that modern science and nation state were born at about the same time and larger nation states only came up when science had spread. You need to be able to talk with each other. Anti-science sentiments in the USA are thus worrying. We should also not freak out. Scientists are still one of the most trusted professions and even the enemies of science typically claim to be friends of Science. In Canada even literally. This shows how strong science still is culturally. Still when scientists speak truth to power, it is worrying how easy it is for US corporations to hit back, via think tanks, FOIA harassment and bribing politicians. Republican politicians are the best investment for corporations because conservatives tend to follow the leader more. Corporations are not charities, those campaign contributions are investments with high rate of return. Also for the sake of the economy corporations need to compete on the market again. The New York Times reports that congressional Republicans are unwilling to help communities in Florida to cope with the consequences of sea level rise and block the Navy from adapting to the ongoing changes. When America is invaded during high tides, I hope that Republican congressman Buck of Colorado will repeat his claim that the military should not be distracted by a "radical climate change agenda". There was a time when national defense was one of the highest priorities of the Republican party, now corporate brides make them weaken national defense and ignore communities in need. Even communities in swing states. The good news is that Republican voters are just as fed up with the corrupting influence of money on politics as Democrats. The bad news is that the current politicians got into their positions because they are good in finding donors and do not want to disappoint them. Still begging for money is no fun and many politicians got into politics for good reasons. So together with some people power, it should be possible to reduce the influence of money. Accepting the money and misinforming your constituents gives a short term boost, especially for the incumbents. In the long term you cannot do anything without trust and you lose contact with the ground. The American political system is more vulnerable for bribery because the voter does not have much choice. If the special interest can convince party A that they can also convince party B with a generous contribution, there is no downside for any of the parties. Furthermore, because of the two-party system your vote nearly never matters. That makes it less motivating to pay attention what happens and whether politicians do a good job. If no one is looking, it is less dangerous to do the bidding of the donors rather than the voters. Here the crisis in the media also returns because less journalists also means that less people are looking. whenever the people are well-informed, they can be trusted with their own government; that, whenever things get so far wrong as to attract their notice, they may be relied on to set them to rights. I prefer parliamentary democracies, but if you want to introduce more competition between the parties within the district system used in the USA, you could introduce Preferential Voting, like Australia does. Here the voters are required to indicate their first preference, but they can also indicate the order of preference of the other candidates. Free-market Republicans could thus vote for Gary Johnson as first preference and vote for Trump or Clinton as second preference to make sure the vote does not go wasted. Similarly Bernie Sanders supporters could indicate Green party candidate Jill Stein without the risk of this causing a Trump catastrophe. Without a return to rationality, this process is going to be very messy. I will not call it likely, but I would not even be surprised if the Republican party would fall apart like the [[Whig party]] did over slavery. The GOP did not have a real leader for years. The party spans a broad coalition, many groups of which have radicalized suffering under a black president, but because their politics were limited to blocking everything, there was hardly any discussions about the political program. Add to this the frustration of losing and bad future prospects due to demographics, which Trump made a lot worse, and you get a dangerous situation, especially when you cannot negotiate and debate rationally. The GOP meddling in private lives of consenting adults, their xenophobia and anti-science stance will make their demographic problems with young people below 45, science enthusiasts and non-whites larger and larger. There is no need for that. What people do in their bedrooms could just as well be seen as a private affair than as something the Washington should police. Immigrants are on average quite conservative and most would likely vote conservative if the conservatives would not reject them. Conservative parties outside of USA embrace science, scientists used to be proud conservatives and in Europe a large part of the faculty, if not the majority, is conservative. A debate is not possible when the only response to inconvenient facts is "Lying Ted" and insults. Already the body language of the Trump supporter indicates that he will defend Trump no matter the argument. The same attitude I encounter when I visit the mitigation skeptical blog Watts Up With That. They are determined not to have a productive debate. Washington Post on the 2013 Republican National Committee’s Growth and Opportunity Project report: GOP autopsy report goes bold. 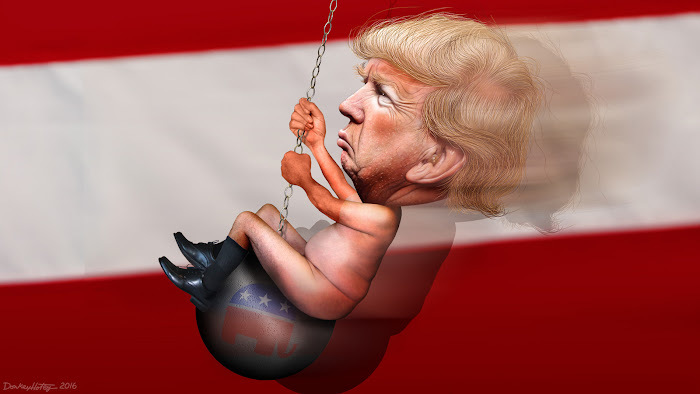 * Caricature at the top, Donald Trump - Riding the Wrecking Ball by DonkeyHotey used under a Creative Commons Attribution-Share Alike 2.0 Generic (CC BY-SA 2.0) license. 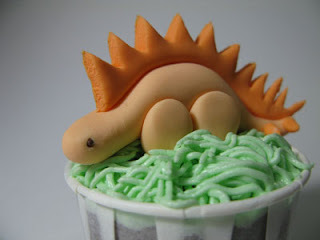 Dinosaur Birthday Cupcakes by abakedcreation used under a Creative Commons Attribution-NonCommercial-NoDerivs 2.0 Generic (CC BY-NC-ND 2.0) license.